This book addresses intensification and modal necessity in Mandarin Chinese. Intensification is used in this book to describe the speaker’s emphasis on a proposition, because, by emphasizing on a proposition, the speaker intensifies the degree of his/her confidence and affirmativeness toward the truth of a proposition, cf. the distinction between ‘weaker’ and ‘stronger’. Modal necessity discussed in this book refers either to the speaker’s certainty regarding the truth of an inference, judgment or stipulation, that is, epistemic necessity or to the speaker’s certainty concerning the obligatoriness of a proposition, based on rules or regulations, i.e., deontic necessity. This book examines a series of lexical items in Mandarin Chinese that express either intensification or modal necessity, provides a unified semantics and also presents how these lexical items are semantically distinct. 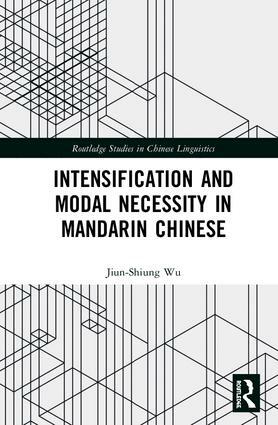 Intensification and Modal Necessity in Mandarin Chinese is aimed at instructors, researchers and post-graduate students of Chinese Linguistics. Jiun-Shiung Wu is a Professor of Linguistics and Director of the Institute of Linguistics at National Chung Cheng University, Chiayi, Taiwan. He received a Ph.D. degree in linguistics from University of Texas at Austin, Texas, U.S.A, May, 2003. He served as the President of Linguistic Society of Taiwan from February, 2010 to January, 2012. He is a board member of International Association of Chinese Linguistics. He is the author of Temporal and Atemporal Relations in Mandarin. Taiwan Journal of Linguistics Monograph Series No. 2. He also publishes more than a dozen of journal papers and has more than thirty conference presentations.